Abstract: We present an analysis of spectroscopic and astrometric data from APOGEE-2 and Gaia DR2 to identify structures toward the Orion Complex. 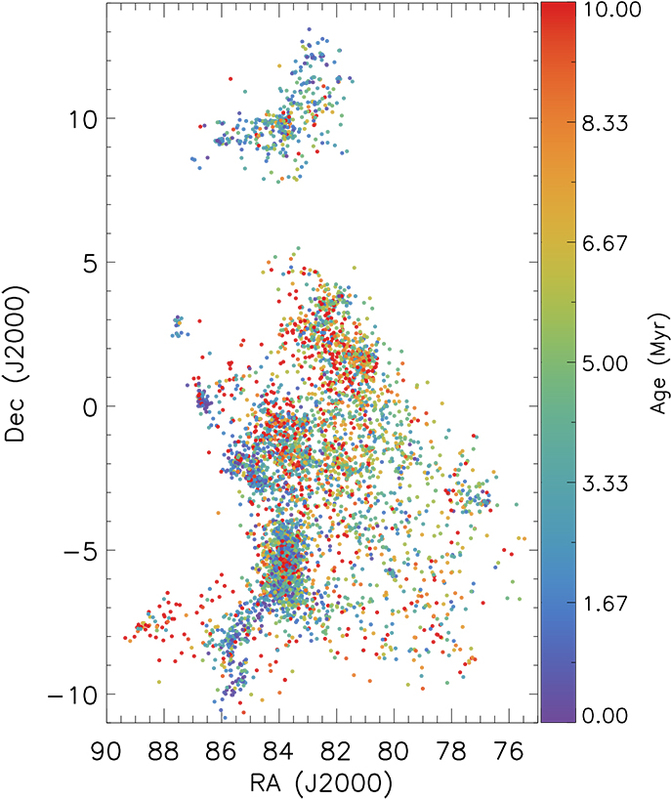 By applying a hierarchical clustering algorithm to the six-dimensional stellar data, we identify spatially and/or kinematically distinct groups of young stellar objects with ages ranging from 1 to 12 Myr. 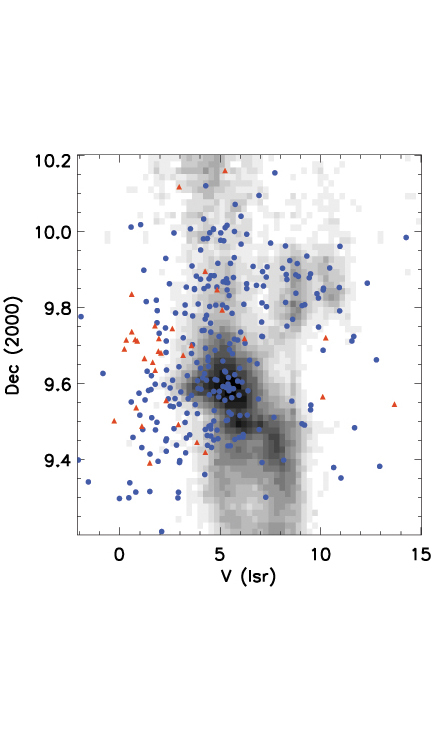 We also investigate the star-forming history within the Orion Complex and identify peculiar subclusters. With this method we reconstruct the older populations in the regions that are currently largely devoid of molecular gas, such as Orion C (which includes the σ Ori cluster) and Orion D (the population that traces Ori OB1a, OB1b, and Orion X). 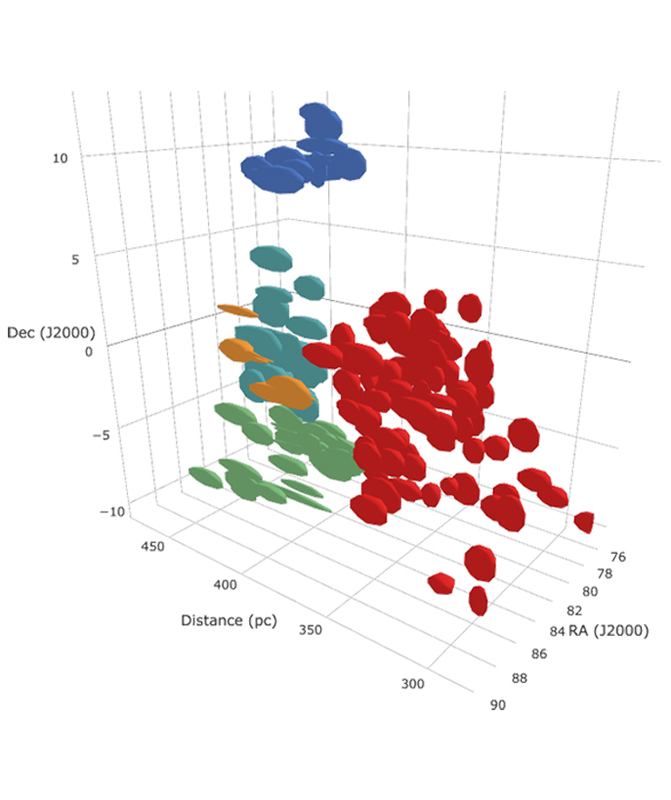 We report on the distances, kinematics, and ages of the groups within the Complex. The Orion D group is in the process of expanding. On the other hand, Orion B is still in the process of contraction. 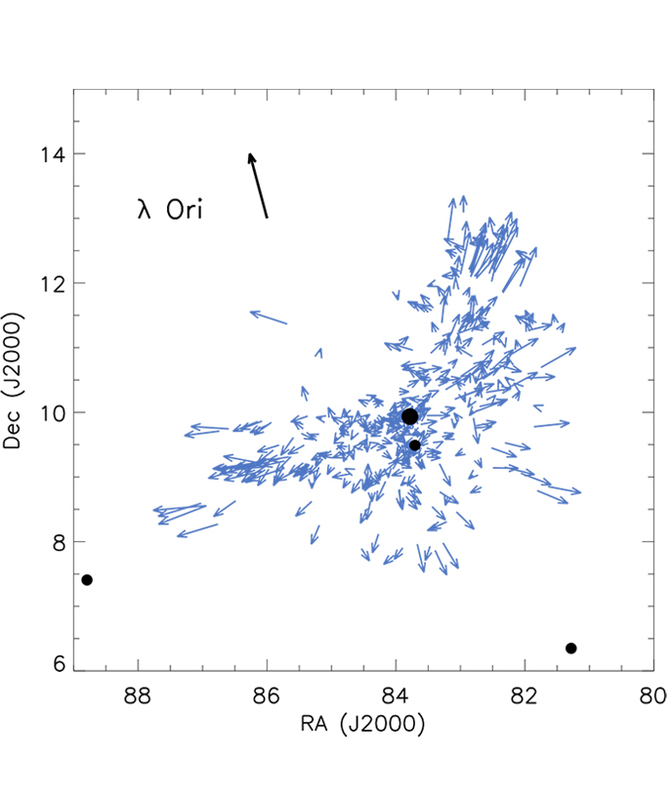 In λ Ori the proper motions are consistent with a radial expansion due to an explosion from a supernova; the traceback age from the expansion exceeds the age of the youngest stars formed near the outer edges of the region, and their formation would have been triggered when they were halfway from the cluster center to their current positions. 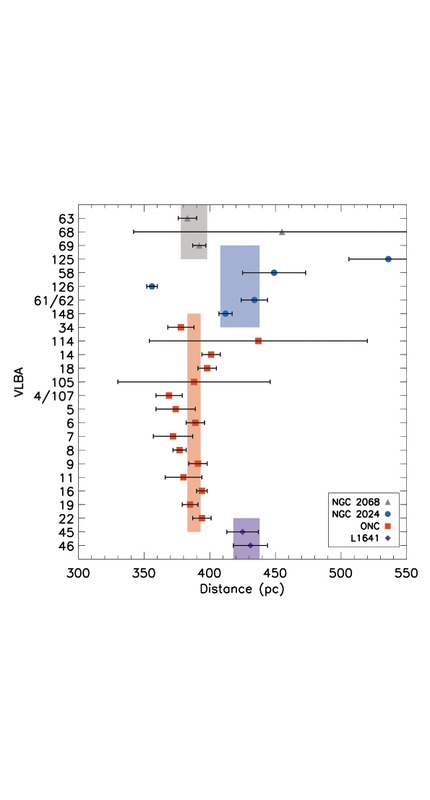 We also present a comparison between the parallax and proper-motion solutions obtained by Gaia DR2 and those obtained toward star-forming regions by the Very Long Baseline Array. Kounkel, M.; Hartmann, L.; Loinard, L.; Ortiz-Léon, G. N.; Mioduszewski, A. J.; Rodríguez, L. F.; Dzib, S. A.; Torres, R. M.; Pech, G.; Galli, P. A.; Rivera, J. L.; Boden, A. F.; E., Neal J.; Briceño, C.; Tobin, J. J.; 2016, ApJ, in pres. 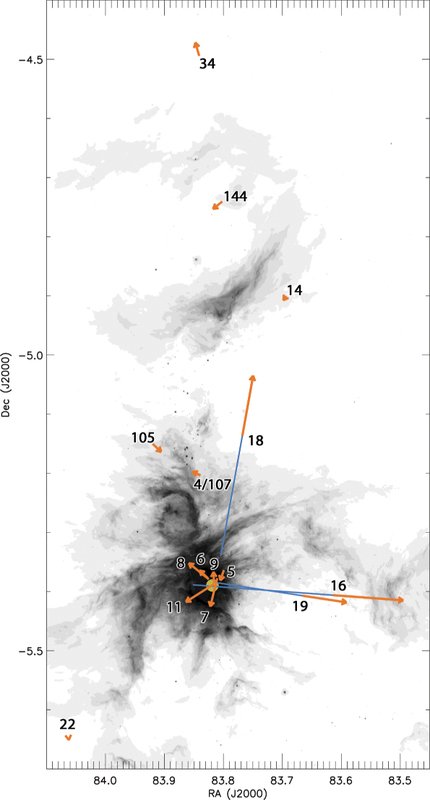 Abstract: We present the results of the Gould's Belt Distances Survey (GOBELINS) of young star forming regions towards the Orion Molecular Cloud Complex. We detected 36 YSOs with the Very Large Baseline Array (VLBA), 27 of which have been observed in at least 3 epochs over the course of 2 years. At least half of these YSOs belong to multiple systems. We obtained parallax and proper motions towards these stars to study the structure and kinematics of the Complex. We measured a distance of 388±5 pc towards the Orion Nebula Cluster, 428±10 pc towards the southern portion L1641, 388±10 pc towards NGC 2068, and roughly ∼420 pc towards NGC 2024. Finally, we observed a strong degree of plasma radio scattering towards λ Ori. 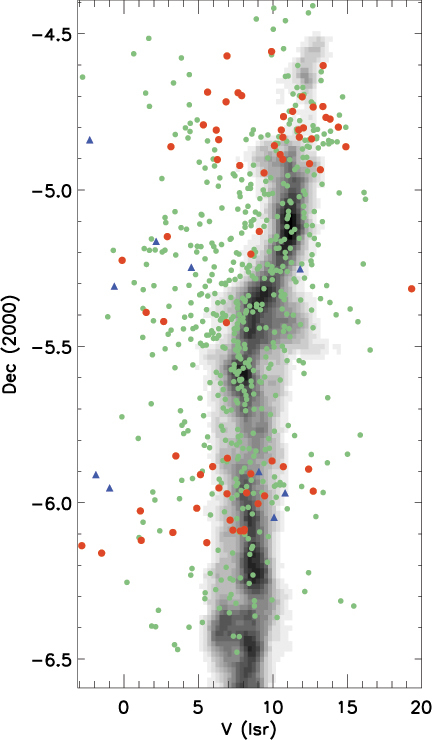 Abstract: We present a near-infrared survey for the visual multiples in the Orion molecular clouds region at separations between 100 and 1000 au. These data were acquired at 1.6 μm with the NICMOS and WFC3 cameras on the Hubble Space Telescope. Additional photometry was obtained for some of the sources at 2.05 μm with NICMOS and in the L' band with NSFCAM2 on NASA’s InfraRed Telescope Facility. Toward 129 protostars and 197 pre-main-sequence stars with disks observed with WFC3, we detect 21 and 28 candidate companions between the projected separations of 100-1000 au, of which less than 5 and 8, respectively, are chance line-of-sight coincidences. The resulting companion fraction (CF) after the correction for the line-of-sight contamination is 14.4-1.3+1.1% for protostars and 12.5-0.8+1.2% for the pre-main-sequence stars. 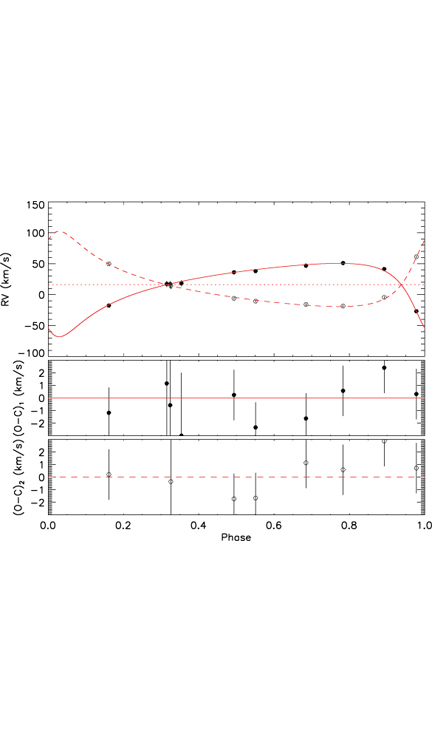 These values are similar to those found for main-sequence stars, suggesting that there is little variation in the CF with evolution, although several observational biases may mask a decrease in the CF from protostars to the main-sequence stars. After segregating the sample into two populations based on the surrounding surface density of young stellar objects, we find that the CF in the high stellar density regions (ΣYSO > 45 pc-2) is approximately 50% higher than that found in the low stellar density regions (ΣYSO < 45 pc-2). 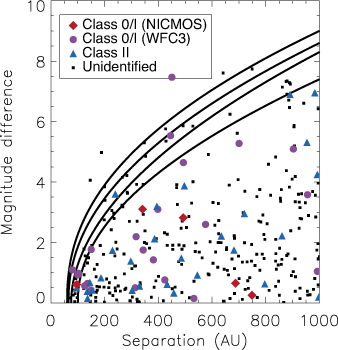 We interpret this as evidence for the elevated formation of companions at 100-1000 au in the denser environments of Orion. We discuss possible reasons for this elevated formation. Abstract: We examine the spectroscopic binary population for two massive nearby regions of clustered star formation, the Orion Nebula Cluster (ONC) and NGC 2264, supplementing the data presented by Tobin et al. with more recent observations and more extensive analysis. 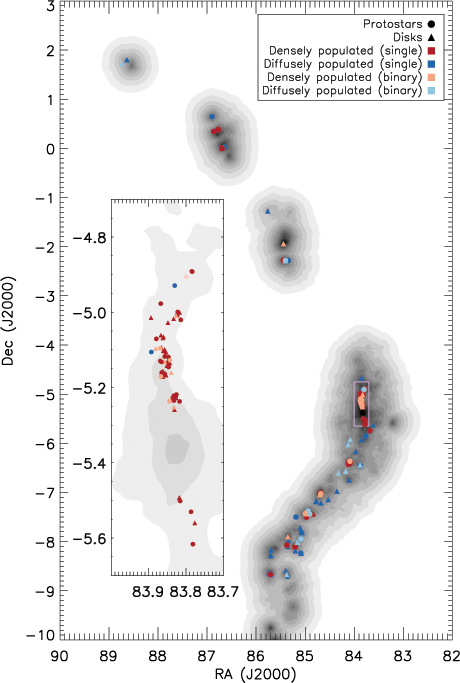 The inferred multiplicity fraction up to 10 au based on these observations is 5.3 ± 1.2% for NGC 2264 and 5.8 ± 1.1% for the ONC; these values are consistent with the distribution of binaries in the field in the relevant parameter range. Eight of the multiple systems in the sample have enough epochs to perform an initial fit for the orbital parameters. Two of these sources are double-lined spectroscopic binaries; for them, we determine the mass ratio. 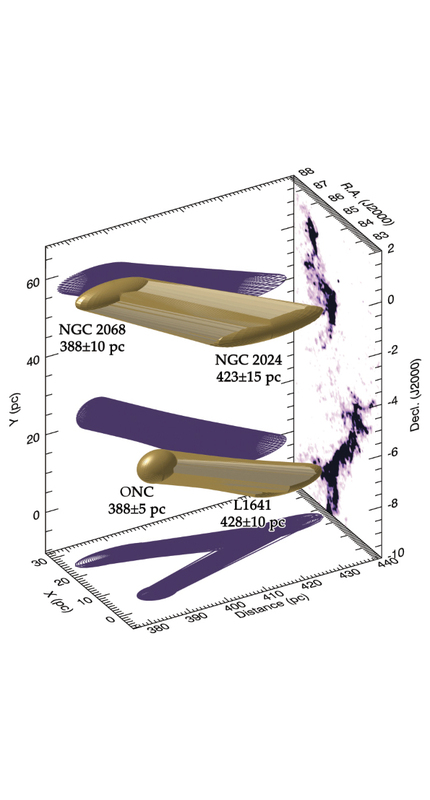 Our reanalysis of the distribution of stellar radial velocities toward these clusters presents a significantly better agreement between stellar and gas kinematics than was previously thought.